Turn up the heat this Valentine’s Day at our hot sauce & salsa White Elephant followed by an especially spicy edition of Love at First Pint! Starting at 5pm, bring in your favorite hot sauce or salsa to swap with others! It can be homemade or a pantry stable. (Be creative, please -- no Tabasco). Sign up and see more details here. 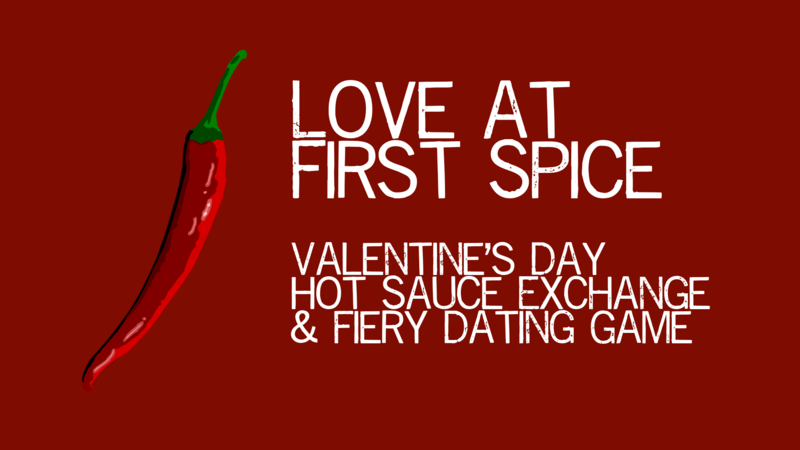 And for our single spice lovers, an extra hot version of Love at First Pint kicks off at 7pm. (Think Hot Ones, but you know… romantic.) Our hosts from Mettlesome will interview 6 men and women seeking women. Each question comes with a progressively spicier hot wing. The audience will choose the winner, who will immediately go on to be the dater in our live dating show. Want to try your hand at burning love? Sign up here. To drive the theme home, we'll have a small batch of spicy Steak Knives -- our imperial stout -- brewed with local hot peppers and a spice themed Trivia starting at 9pm. So come mingle and tingle with us this Valentine’s day -- good times guaranteed whether you're taken, single, or it’s complicated.